The Feed the Future Kenya Accelerated Value Chain Development program seeks to widely apply technologies and innovations for selected value chains in order to competitively and sustainably increase productivity, contributing to inclusive agricultural growth, nutrition and food security in the country. The program’s main goal is to sustainably reduce poverty and hunger in the Feed the Future zones of influence in Kenya. Focusing on the livestock, dairy, staple crops root crops and staple drought tolerant crops value chains in 21 counties in Kenya, the program aims to lift 326,000 households out of poverty, making them food secure and enabling their transition from subsistence to market-orientated farming. As the U.S. Government’s global hunger and food security initiative, we’re transforming lives toward a world where people no longer face the agony and injustice of extreme poverty, undernutrition and hunger. 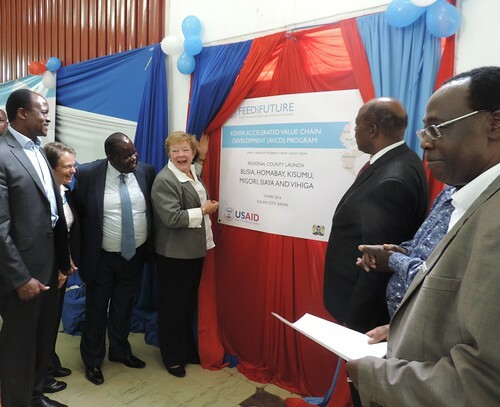 Kenya is one of the 19 strategic country partners under Feed the Future, the United States Presidential global hunger and food security initiative. While the challenges are great, so are the opportunities. With the largest dairy herd in east and southern Africa, Kenya has the potential to meet local demand for dairy and target regional markets. As one of the largest African exporters of fresh produce to Europe, Kenya’s horticulture industry can expand domestic, regional and international markets. Markets, in turn, can significantly grow through reforms that address standards and quality, policy constraints, irrigation, roads, agricultural inputs, extension, and market access promotion. Feed the Future is helping Kenya capitalize on these opportunities in agriculture to meet the country’s food security and nutrition challenges. 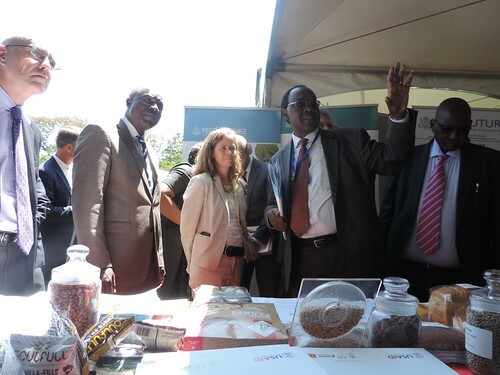 The program is focusing its efforts on improving several key agricultural value chains in Kenya: dairy ; drought-tolerant staple crops (sorghum/millet and root crop systems) and pulses for the semi-arid areas; and livestock and dairy in arid and semi-arid lands of northern Kenya. Feed the Future addresses the whole value chain with a special focus on the weakest “links,” from inputs like fertilizer, seeds, and livestock vaccines to credit, production methods, storage, transport, processing, farmers’ cooperatives, and markets in Kenya, East Africa and overseas. KWOSP is implementing a 5-year orphans and vulnerable children (OVC) program in Kisumu County, Kisumu East, NYalenda, dubbed MWENDO in Partnership with CRS AND USAID, which seeks to empower local and county-level OVC stakeholders to strengthen the formal and informal HIV and child protection systems and services and the linkages between them, including cross-sectoral service referrals and coordination to ensure quality service delivery for OVC, Caregivers and their households. Under the programme the organization seeks to empower caregivers through Agribusiness and market knowledge. We also seek to Work closely with Farmer to Farmer to provide technical assistance to farmer-focused saving groups and caregiver groups where appropriate. Our organization seeks to partner with your Organization to improve the caregivers output through smart agricultural approach to reduce poverty by increasing their inputs and saving groups. Our organization has seen the impact that FEED THE FUTURE interventions have made in Kenya and hope that they could extend the same to our caregivers and the livelihood of the OVC in Kisumu. At the moment, the Department HES(Household Economic Strengthening has undertaken the creation of Multistorey Kitchen gardens for our caregivers and see the need to partner with you to expand what we have started to reach your standards of Agribusiness. We seek to partner through Trainings of caregivers and other aspects of the programme to ensure that the OVC can have access to proper nutrition and the caregivers can save and provide more for the OVC. We hope that we could work with your Kisumu Office in Kenya.